RAILWAYS: My interest in model rail systems ensured a significant interest in full size rail, in particular German Railways due to my appreciation of the German 'Marklin' Model Railway Systems. I am visiting a wide range of Railway Systems and Museums throughout the World. The Home of the Santa Fe 'Warbonnets', the Museum includes a wide variety of Steam and Diesel Locomotives, Passenger and Freight cars. The 'Ghosts of Travellers Past, circa 1932' was a somewhat scary Exhibition during my visit. The 'clickable' image depicts the #315: Santa Fe Super Chief 'Warbonnet' Locomotive, double ended with the identical #316 Locomotive. The extremely busy Santa Fe Depot in Temple, Texas is a real treat to observe Train and Shunting Operations. The Depot includes a Rail Museum adjacent which includes Steam, Diesel and Rolling Stock exhibits. The 'clickable' image depicts the #3423: 4-6-2, Pacific Class Steam Locomotive. A pair of beautifully maintained Depots, the Palestine and Rusk Depots include Diesel, Steam and Rolling Stock exhibits, however it is the maintenance of the overall facilities that struck me and the friendliness of the Staff and Volunteers. The 'clickable' image depicts the #316: 4-6-0 Steam Locomotive undergoing maintenance at the Palestine Engine Shed. A very small Museum by any standards, nevertheless there is one Steam, one Diesel and a limited number of Rolling Stock exhibits. The 'clickable' image depicts the #13083: Caboose. The Nevada State Railway Museum located in Boulder City contains a wide variety of Nevada's Engines, Rolling Stock and trackside facilities. The 'clickable' image depicts Pacific Lumber #35, 2-8-2 Locomotive. The Nevada Northern Railway Museum located in Ely contains a wide variety of Nevada's Engines, Rolling Stock and trackside facilities. The 'clickable' image depicts Diesel Locomotive #109. The Didcot Railway Centre is located in the English town of Didcot, it is nestled directly alongside the busy Didcot modern railway station. The Didcot Railway Centre houses a massive array of GWR Rail stock and the site is dominated by an equally massive Engine Shed. 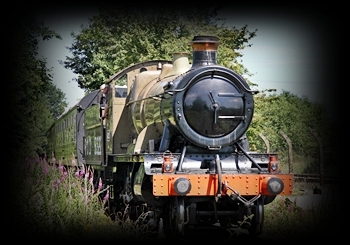 The 'clickable' image depicts Steam Locomotive #5322 taking visitors along the Didcot Railway Centre track. A trip to the National Railway Museum in York certainly kindled an interest and due admiration to some of the Pioneers of Steam Railways emanating from Britain. The 'clickable' image depicts the front of a Tank Loco exhibited outside the entry to the Museum. Probably the most impressive Steam Engines ever built, the look of the huge Black Locomotives with the red trim, very impressive. The 'clickable' image depicts part of the 2-10-0 wheel arrangement of a DR 52 Class of 1960. There are so many types of Railways on the Island powered by Steam, Electric and Horse Drawn Trams, all so impressively maintained. The 'clickable' image depicts a 2-4-0 Tank Loco at Douglas Railway Station. A massive Museum, located at Thirlmere (near Picton), New South Wales. Steam and Diesel Locomotives, a wide range of Rolling Stock, an Engine Shed and a fully operational turntable are highlights of the Museum. The 'clickable' image depicts the Museum's oldest exhibit, the #18: 0-6-0 was built by R. Stephenson & Co. in 1864. A minor but nevertheless interesting Railway Museum, associated Railway and period Train Stations. Maintained by Volunteers, the Locomotive and Rolling Stock Collection is significant with examples obtained from various States of Australia. The 'clickable' image depicts an 0-6-0 Diesel Shunter. Belgrave to Gembrook through the Dandenong Ranges, Victoria. A magical narrow gauge (2ft6in, 762mm) Railway operating a wide variety of Steam Locomotives and three Diesel Locomotives, Diesel is used during periods of high fire danger. The 'clickable' image depicts #14A Steam Locomotive, originally built in 1914. The Museum includes displays of Trams from New South Wales, Victoria, Berlin, Munich, Nagasaki and San Francisco. Volunteers provide Tram rides at regular intervals on the Museum's private Tramway facility. The 'clickable' image depicts #141 Tram display.